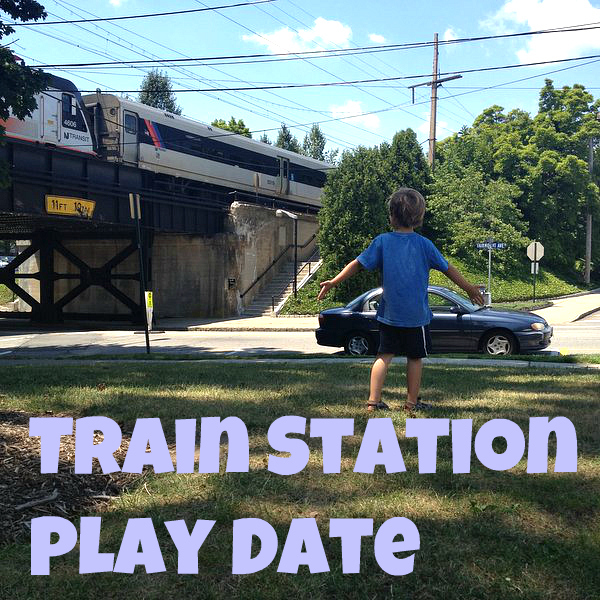 Trains are huge in our house, so for a fun afternoon out, I brought the boys to a local train station. I filled our Thomas The Tank Engine Backpack with three favorite train books, our train whistle, and several Thomas trains. Trains by Byron Barton: This board book follows one train’s journey, passing towns and several other kinds of trains. Freight Train by Donald Crews: This book has been an almost daily choice for years. So it’s well-loved and taped together. The book describes the train and its cars, and several types of freight on its journey through mountains, by cities, over trestles, in darkness and light. 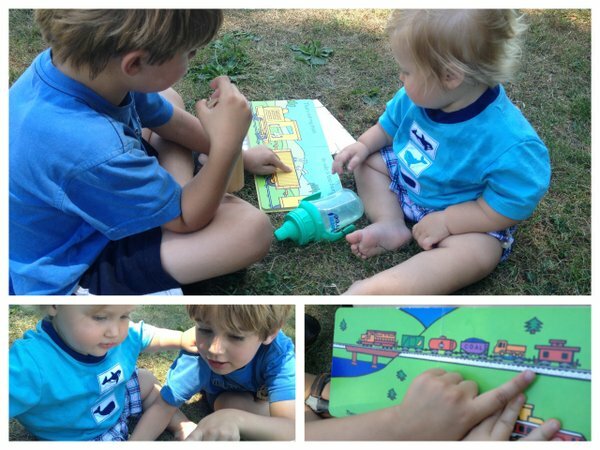 That’s Not My Train by Fiona Watt: This board book is one of my baby’s favorites. It shows several trains and each has a textured aspect to touch and feel (for example, one train has a “rusty” funnel made out of sandpaper). As we read, my older son pointed out different types of trains to his little brother. We discussed the trains in the books, and how they are similar and different to the train that runs on the tracks near us. We talked about this in terms of both the type of train (ours is electric, as compared with diesel or steam), and what the train carries (ours carries passengers, not freight). I also realized we hadn’t fully discussed train tracks with our 4 year old before. He knows trains run on tracks, but I asked him, if we walked right next to the tracks (we didn’t – for one thing, where we were, the track is elevated), where would we wind up? At first he was stuck on “We would be with the train.” But eventually he got to the answer – New York City. calling, “all aboard!” and passengers getting on and off. Of course, both boys spent a lot of time playing with the toy trains! It was a fun way for them to make connections between the trains they see in books, the trains they play with, and the trains they see passing by our town. Next up – our municipal airport!